The City of Cleveland is committed to green buildings because they provide safe, affordable and healthy environments for residents and workers. A key part of green building is energy efficiency, which lowers operating costs and reduces greenhouse gas emissions. By instituting energy efficiency and conservation initiatives in City facilities, operations, and vehicle fleets, we are saving taxpayer money and taking the right steps towards carbon neutrality. Through education, policies, and programs, the City empowers employees, businesses, and residents to take action to be more energy efficient. In 2012, The City of Cleveland joined the Cleveland 2030 District and the Better Buildings Challenge. The 2030 District works to create a coalition of building owners, service professionals and community stakeholders working together to rapidly transform the built environment of the city through large-scale reductions in energy use, water use and GHG-emissions. The Better Buildings Challenge, a White House and Department of Energy initiative, supports building owners by providing technical assistance and proven solutions for energy efficiency. As part of the Challenge, the City of Cleveland has committed to reducing its building energy usage 20% by 2020, using a 2010 baseline. 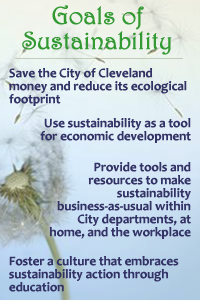 In 2013, the City of Cleveland adopted a Sustainable Municipal Building Policy is expected to yield savings by efficiently managing energy, water, waste, and stormwater at City facilities, while improving the employee and visitor experience. The policy requires that green building practices are incorporated into the siting, design, construction, remodeling, repair, maintenance, operation, and deconstruction of all City facilities. The City of Cleveland is excited to bring back the popular Cleveland Energy$aver Program in partnership with Empower Gas & Electric. FREE onsite energy assessments will identify cost-effective energy saving improvements. Program staff will guide all interested through implementation. Additional information is available on the Cleveland Energy Saver website. Consultations can be scheduled online or at 855.343.7884. Small business owners can join the COSE Energy Program to get a comprehensive energy assessment and access to utility rebates and incentives. Building owners can join the Cleveland 2030 District to collaborate with others seeking to easily manage their energy use. Cleveland is a leader in the nation with in striving to meet the LEED-ND (Leadership in Energy and Environmental Design for Neighborhood Developments) standards. Example projects include the Flats East Bank Neighborhood and St. Luke's Pointe. The City of Cleveland is procuring LED replacement lights in City facilities and streetlights. Replacing the 67,000 streetlights with LEDs would save the City millions of dollars in operating revenue and prevent the emission of more than 25,000 metric tons of carbon annually through reduced energy use. The Cleveland Division of Water (CWD) recently completed the Kirtland Pump Station Project, and is pursuing Silver LEED certification for the newly constructed Specialty Maintenance Building. Construction materials were recycled and utilized for the new building’s foundation. This project is a component of CWD’s 15-year, $750 million Plant Enhancement Program that is substantially enhancing and restoring CWD’s four water-treatment plants and large ancillary facilities. The $21.1 million project was completed $904,000 under budget.